Traditional wisdom dictates that whenever one wants all the sounds, all the music’s frequencies, coming from one and the same loudspeaker driver, the unit’s ideal size should be 8 inches. 7” is also debatable but 6/4 inch, or 10/12 inch at the other end, would take us to another, completely different game. In all loudspeakers, and widebanders especially, it’s always a matter of making compromises, and trying to be as good as one can in making those compromises. With regard to a 8 incher, a six inch driver presents a slightly different set of compromises. It is in this light we should approach the French PHY-HP’s new 6 incher, the E17 LB15. But before that, a few words about the background. I remember talking to Bernard Salabert, the founder of the PHY-HP, several times over the phone and whenever we met, about a possible smaller, smaller than 21cm, widebandwidth driver. The driver was supposed to be such that it would preserve the quality criteria of the PHY drivers, so that Bernard would not need to worry about abandoning his principles, but whose price would not drive DIY enthusiasts into bankruptcy. For a long time Bernard was against such a unit. The initiative did not come from him. As I understood it, the main reason for his resistance was that he knew too well what would be the optimum when it comes to the ideal widebandwidth driver. All those thoughts culminated and crystallized in his most beloved child: the technically and aesthetically beautiful eight incher H21 LB15. Bernard too knew it: eight inches it had to be. Painfully aware of what went into his eight incher, what developing it had required from him in terms of the design and manufacturing (for example, building up one of the best anechoic chambers in France, and a much bigger one than many of the international companies have in their use) and personal effort, I sympathized with his vision. However, his closest partners pressed Bernard, and gradually he warmed up to the idea; first, to the idea that there were a folk version of the H21 with a ferrite magnet and a chassis that would not be bronze, then to the idea that he should design an entirely new driver. As time went by, Bernard’s interest continued to grow and I remember that finally he was very excited about the new little PHY driver, as he was about his other plans for the PHY’s future. The continuing financial hardships, the banks in the neck, the inability of subcontractors to deliver parts that would meet the required quality level and on schedule, heavy smoking and Armagnac’s sun-matured wine grapes took Bernard prematurely into the dark waters of the underworld. By that time some kind of prototype of the new 6 inch driver already existed, but if I recall correctly, not the final version. PHY was Bernard Salabert. When such a person is lost, any firm would have to take a long and deep breath before going on. Years have passed now and seems that PHY’s activity has gradually returned to its normal course. The old drivers are being manufactured, on request anyway, and along with them the six incher E17 LB15, as well as the new ferrite/steel version of the H21. Would Bernard be happy about how things area now? I cannot say but if the work he started goes on, he hardly would be too unhappy. Before introducing the new 17cm driver in depth, it is good to dedicate a moment or two to Bernard’s intellectual heritage. It’s huge. Along with him we lost an entire era, or more accurately, an important mid-period between two eras. Bernard was like the last pupil of some famous composer / solo musician (say, Listz). He carefully examined what the masters of the industry had done and thought about before him, and why. He knew the speaker history profoundly and most importantly, he also knew it outside the Anglo-American language area. And his knowledge wasn’t superficial, the understanding took place at the level of very detailed solutions. He wasn’t against new technology in itself, but as those who know history of technology generally do, he did not rush after it with a watering mouth. New technology or his own ideas of how the old technology could be improved, he used only if thought they brought genuine enhancement to the old. He had tremendous respect for old masters. Unlike many modern engineers, blinded by their omni-potency, he did not doubt for a moment that the loudspeaker designers of the two prior generations, knew exactly what they were doing. “The less distortion, the better”. That was a mere generalization to Bernard. It was the beginning of the analysis, not the end of it. The masters honored by Bernard never accepted such claims at the face value. They always tried to understand what the technical requirement or improvement meant in a realistic situation, when actually listening to music, and with what sort of music, how essential or irrelevant a technical feature was or not. 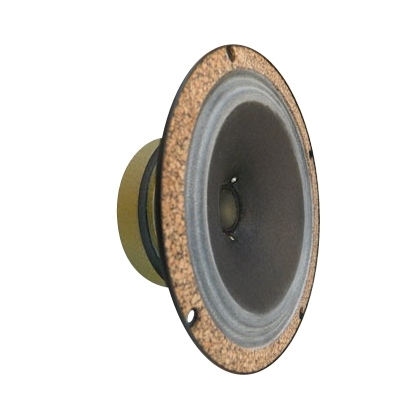 Technically the “perfect” speaker driver may not be the best driver with music. As said, the design of a speaker element was and still is art of making compromises, the sort of compromises not explained in text books. They are like small tricks rising from a long experience and that a masters teaches to his apprentice. One example. For Bernard, the width of the frequency band reproduced by a loudspeaker was a way less important in the music play back, as compared to the relationship between the treble and bass reproduction, i.e. the right relative balance between the two, which was the core of everything. There was the famous formula to calculate how low the bass should descend and in what way given that the treble reaches a certain frequency. The eight inch PHY H21 LB15 goes up to 9.5 – 10kHz before the response falls, and Bernard did not warm up to the idea of extending the response with a whizzer-cone or similar. The driver sounds, however, “full range”, as if it covered the entire frequency band, provided the bass response is carefully trimmed to fit the treble performance. That’s the secret. To what extent the partly missing highest octave is aurally detectable, depends, according to Bernard, entirely on the tonal balance, how the loudspeaker designer has managed to fix it. For his critics Bernard also always reminded that with the 96dB sensitivity of the H21 there was always 85dB (1 watt) left even at the 14-15kHz. These may sound like small design parameters, but it took years for Bernard to find a proper solution to all of them. In total, Bernard spent 15 years in developing just the one unit, the H21, including making his own machinery for manufacturing. 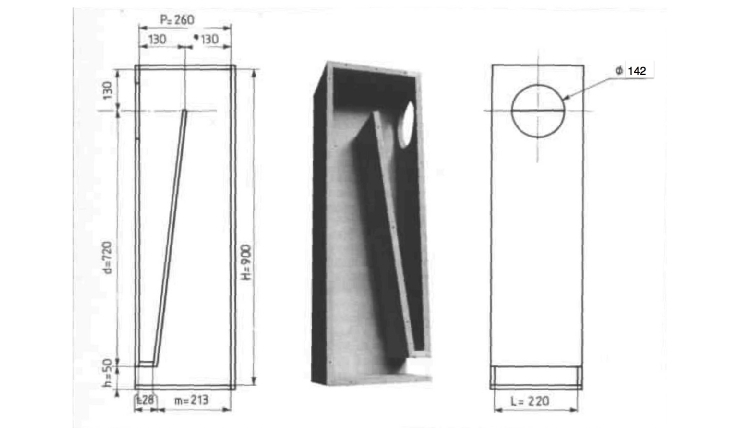 The way in which the 8 inch H21 produces pure treble up to 10 kHz depends on the profile of the cone (hyperbolic-exponential), its material composition and density on each square cm of the cone’s surface, the dust cup structure and so on. These may sound like small design parameters, but it took years for Bernard to find a proper solution to all of them. In total, Bernard spent 15 years in developing just the one unit, the H21, including making his own machinery for manufacturing. The cone material itself was unquestionably paper fiber. I do not think Bernard would ever have used any synthetic materials, nano or non-nano, even if he had been offered them for free. With ultra thin paper fiber mass (one can actually see through the cones), the mass of moving parts remained sufficiently small and also, gave the sound a certain nature. It is well documented how Bernard didn’t appreciate the sinusoidal signal and stressed the role of steep short signals, the impulses and transients. According to Bernard, reproducing the former is a child’s play as compared to the correct reproduction of the latter. The highest transient speed (zero mass of the moving parts: cone, spider, voice coil etc.) Bernard believed he could achieve with paper containing both long and short strings or fibers, and with a narrow voice coil (25mm). For Bernard, the question was just about complying with the laws of physics, and it was not a coincidence, he often used to say, that many of the industry’s best brains made such elements from the ’30s to the’ 70s. And Bernard would never have agreed to use any other than specifically wrapped paper for the cone suspension. Rubber or foam in no form, even if they enabled a greater cone displacement, and thus a lower resonance frequency. When the speaker element is understood as a whole and subject to all sorts of prioritization, as Bernard always did, the limited displacement is not a problem. Sufficient sensitivity, correct loading of the driver and other such factors ensure that the cone does not need to move wildly in order to produce enough bass. In such drivers paper suspension works well. 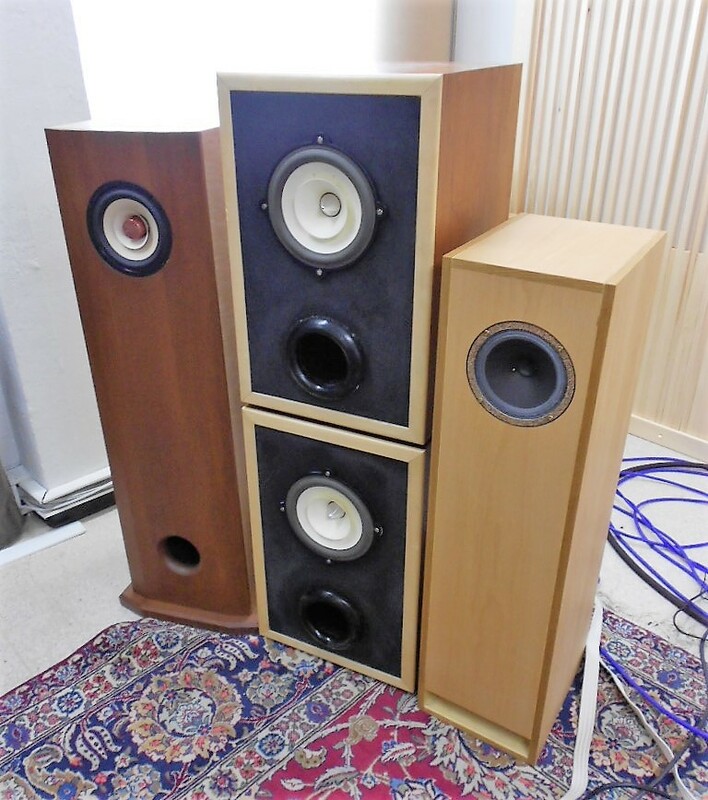 If one follows the sales of vintage drivers, one can see that drivers with paper suspension are often more sought after and cost more than the later versions with the rubber bearing. Along the same lines, it was a fully deliberate decision by Bernard to make the voice coil as high, 8mm, as the air gap length in the magnet. In theory this causes distortion when the motion of the voice coil in the gap grows large enough. But if you test this in paractice with real music, as Bernard always did, using normal volume levels, there will be no audible distortion, he said, and at really high volume levels, the distortion would be masked by other phenomena anyway. On the other hand, the equal lenght of the voice coil and the air gap, as well as the two-sided winding of the voice coil (with silk-insulated 15um silver wire), allows making maximum of the magnetic field and an optimal compromise between the lightness of the voice coil and the impedance – as well as certain sonic virtues related to the ‘sensitivity’ and delicatecy of the sound. In theory this causes distortion when the motion of the voice coil in the gap grows large enough. But if you test this in paractice with real music, as Bernard always did, using normal volume levels, there will be no audible distortion. Even though a widebandwidth element generally speaking is the world’s best ”Doppler driver”, i.e. the best driver to reproduce all those sounds of different frequencies with which the music shoots the widebandwidth element of the microphone constantly moving slow and fast, widebandwidth units too have partial vibrations, breakups, caused by inter-modulation. The real wisdom is lies in how these are harnessed, and that is the sort of wisdom that Bernard wanted to cherish. With the impedance Bernard was equally determined: 16 ohms it ought to be (copper or silver winding). Here he certainly had in mind tube amplifiers. The magnet? Yes, Alnico (3SC) definitely and the G over 1 Tesla. Pot-shaped hubs are made of soft steel with less than 0.20% carbon. Nostalgia, say engineers. Music, said Bernard. Perhaps the most incredible of Bernard’s requirements was that the chassis had to be made of bronze. This was odd also because he had constant difficulties in finding renowned suppliers from France or abroad, in addition to the high price of course. In addition to the fact that bronze is not a magnetic metal, bronze and music have an everlasting connection. Bernard’s drivers need a lot of bronze because the chassis is composed of two-parts: the actual body and the heavy ring on top, both unleaded bronze, but of a slightly different mixture. The body, if ticked, rings and rings. When the ring is on, it’s just a sharp fast-dying click and no ringing whatsoever. Moreover, the ring bends over the paper suspension and so damps waves and resonances arriving the outer edge of the cone. These material experiments remind me of Bernard’s cables in which he (following Pierre Johannet’s research findings) refused to use anything but hard solid silver conductor and fabric as an insulation. But that’s another cup of tea. Not just once or twice did Bernard complain to me how PHY importers could not find satisfactory cabinet solutions for his super elements. “I’ve done one of the world’s best speaker element. It’s some one else’s job to make a suitable cabinet for it”, he uttered in despair. The rather high Qts (c. 0.6) of the PHY drivers reveals that Bernard was not a friend of the sealed or reflex speaker boxes. His overwhelming favorite was in-wall placement, i.e. a true infinite baffle. Next came open-back solutions, straight or folded baffles, cabinets with an open bottom etc. If there had to a cabinet it should be made preferably of soft spruce plywood, not of hard birch plywood. Old well-proven knowledge, this too. Birch plywood is more rigid but tends to resonate unpleasantly. He only recommended birch to be used if the wall was very thin, 3-5 mm, and braced inside with a similar plywood cuts. Bernard had used massive amounts of concrete to build up his own listening space. But when he suddenly stopped the music playback on his own 8 inch element, the thick concrete walls continued to resonate. So his question was: what’s the point of trying to kill resonances in a thin loudspeaker cabinet? Instead, if a cabinet is needed, it is best to make its walls so that they quickly dissipate the absorbed energy forward, and do it differently from different parts of the enclosure. The internal bracing had to be realized asymmetrically, as everything else to Bernard. I remember how he fired a pair of coins underneath the loudspeaker’s legs in order to break the 90 degree angle between the floor and the loudspeaker by a few degrees. Never were the speakers allowed to be equally far from the walls/other nearby surfaces, everything had to be asymmetrical, and that concerned the placement of the driver in the front panel unless the loudspeaker was otherwise asymmetrical. Oh no. There would be enough of these stories for two articles at least. So let’s welcome finally the new family member of the PHY driver collection: the E17 LB15, 170mm widebandwidth driver. The king of the class of six-inchers has long been the Mitsubishi Diatone P 610. Sort of. Off has gone the precious two-piece bronze chassis, and the expensive alnico magnet, and in place of them, the cast steel body and a ferrite magnet (G = 1T). But there’s still the paper cone and paper suspension as well as a similar 25mm double-layer voice coil made of Japanese paper and copper wire. The mass of the moving parts (M) is 3.2 g. Fs is 84.67 Hz, while the fs of the H21 is 40Hz. An octave’s difference! Qts is 0.54 instead of 0.59 of the H21. Z is the same 15 ohms. Bernard was a solid supporter of odd numbers. Therefore, all PHY elements have an odd number of fastening screws, except for this new little PHY with just four screws. 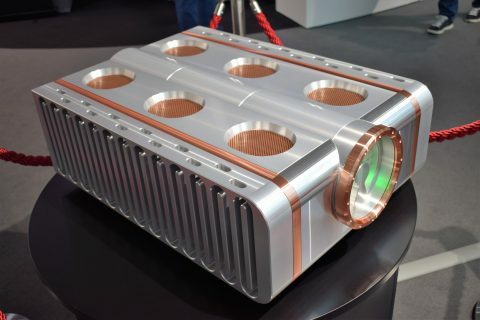 Like in all other PHY drivers, each part of the element must pass through certain specified tests and measurements during the manufacturing process. After intense exposure to strain, the mass of movable parts of each driver must be within 0.1 g, the dc resistance within 0.1 ohms and the frequency response within 1 Hz. This is not just marketing. I remember vividly how serious Bernard was with his tests. It is not easy to manufacture a functional widebandwidth element (ask SEAS if you don’t believe me), let alone two identical matching drivers. That is why Bernard was proud of his achievement. All drivers are numbered and the first owner gets a lifetime warranty for his purchase. For this review, the E17 was screwed into the cabinet of approximately 80cm high, a transmission liner. The drawings for such a cabinet can be found on the PHY homepage. The driver is positioned asymmetrically on the front panel. The top of the transmission line itself and the rear wall behind the driver are lined with sheep wool. There is no reason why a transistor amplifier (Euphya, for example) could not be used, but since tube amplifiers were Bernard’s first choice for his drivers, I drove the E17 TWQ’s mainly with a 12 watt stereo 6V6 tube amp. 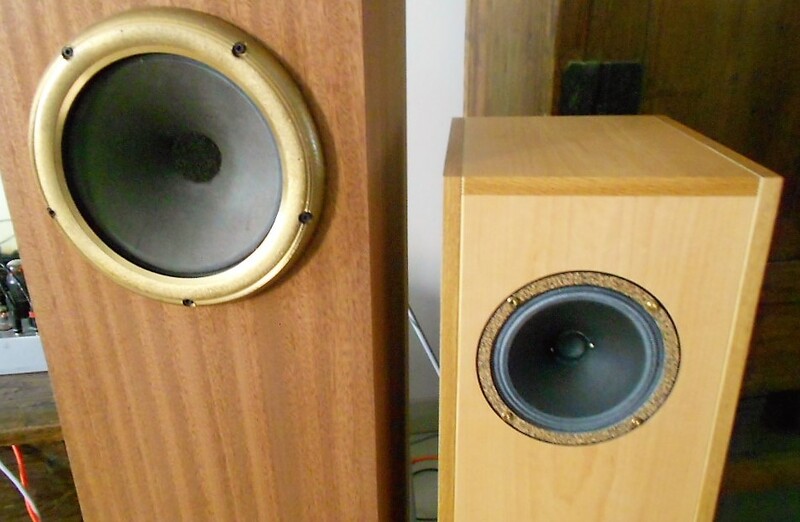 For a comparison, I used a similar TWQ speaker with the H21 as well as a couple of other widebanders. Having said all this, the E17 turned out to be a genuine PHY driver for all the crucial characteristics. One can tell it by the way it talks to the listener, communicates with him or her. Impressions? First, the speaker’s sonic performance was quite satisfactory but not perfect. The TWQ provides a useful starting point for experimenting but I had a feeling that interesting results could be obtained with other cabinet solutions as well. As expected, the bass does not fall particularly low and the bass performance is somewhat inconsistent. Doesn’t matter. All the PHY elements are capable of producing more bass than their size indicates. As a former owner of smaller and bigger PHY units I know that from this little PHY driver too it’s possible to get, with a little extra effort, more competent bass, even if the mid-bass region (c. 50 Hz) remained a bit dry and shy. It was obvious to Bernard that, if pushed hard, the eighth incher H21 had more intermodulation distortion than the 12-incher H30. On an absolute scale, the H30 sounded cleaner and purer than that the H21, even though the H30 had its own compromises. In the same manner the E17 is more likely subject to some break-up modes (intermodulation) if asked to produce very low bass frequencies with force than the H21. In the TWQ cabinet one can hear this as a mild hardening of the sound, compression as the volume goes up. The Law of Physics, simply. Having said all this, the E17 turned out to be a genuine PHY driver for all the crucial characteristics. One can tell it by the way it talks to the listener, communicates with him or her. Even in this small TL enclosure. And, of course, the sound was seamless and unified, wholesome, just like the best widebandwidth drivers can be. 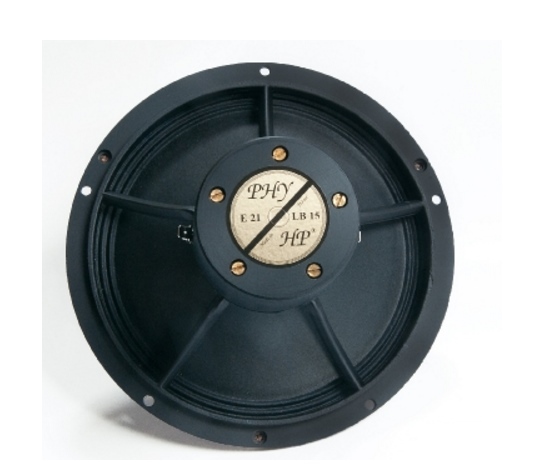 When a PHY driver conveys the music’s details, they are not just clinks or hiss of the treble. The E17 creeps half an octave higher (14kHz) than the H21, but the character of the treble is still widebandish, slightly matte and soft but not dark. The lack of the highest treble can mainly be detected only if there’e a reference next to it. The musical details communicated by the E17 and other PHY drivers lie in the mid-range: as if there were an extra layer of them for the ears to enjoy and analyse. This PHY quality, their delicacy, is immediately recognizable, and it applies to the little E17 too. 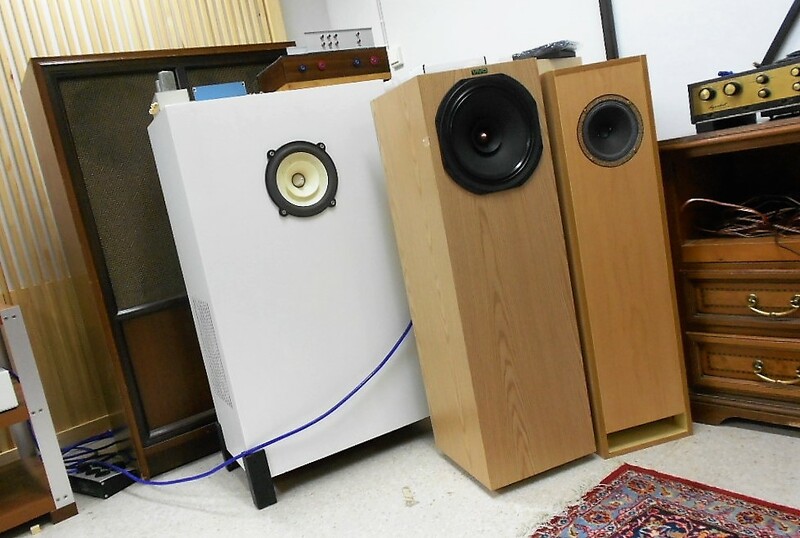 As compared to the three times more expensive H21 in a similar but bigger TL cabinet, the familiarity of the sound was obvious, the sought nature of the sound similar. The E17 appeared a bit brighter and sharper, not as forgiving than the H21. Also, the E17 is slightly more energetic in the mid-range than the gently embracing H21. At the bass there was not a big difference: both sounded somewhat light but pleasing. The E17 TL does not reproduce the body resonances of the cello or the left hand of the piano equally vigorously as the H21 TL, but the nuances of the lowest strings of a cello or guitar come out just fine. The H21 breathes bigger. The sound through the E17 TL is not as large or wide. 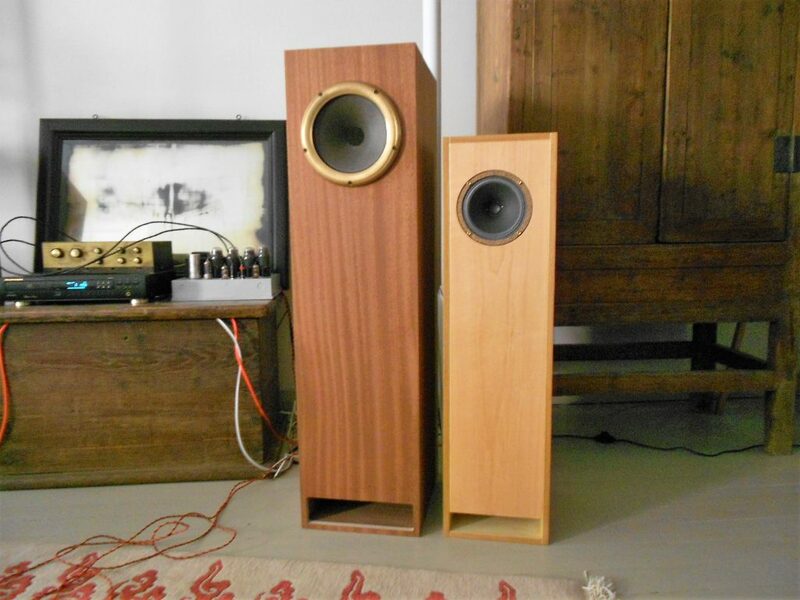 In conclusion, then, the 6 inch E17 in a TWQ cabinet sounds as a genuine PHY driver should, delicately and communicating inner qualities of music, and as such the sound was very promising, in particular with respect to its reasonable price. I would, however, continue to do experiments with other cabinet solutions, open back baffles, for instance. No doubt there will be new compromises, and nobody knew it better than Bernard himself, but the heart warming and musically meaningful sound will likely run the compromises aside somewhere in the background. Finally, as much I enjoyed the E17 L15 over the weeks and months, I must confess how much I miss the fabulous H21, and am not the only one who does so. It’s a damn good unit and all that one really needs, if only one knows what to do with it.